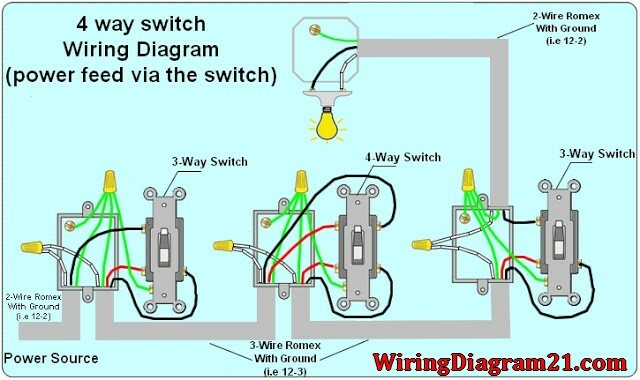 A 4 way switch is a double pole double throw (DPDT) switch. It has 4 terminals or poles and consists of two 3-way switches that are modified. The switch can be used to control the electricity supplying lights from three locations. All four terminals are always brass in color. Traveler wires receive and transfer the electricity from each of the two 3 way switches. A 4-way switch can be used in scenarios where you need to control the lighting of a particular place from 3 points. For example, you could have switches at each end of a hallway and a switch halfway down the hallway. You could also have switches at the top & bottom of a stairway and a switch by the front door. One important factor to always remember is that you can’t have a 4-way switch without two 3-way switches. DANGER: The mains must always be turned off before any work is started. To avoid electrocution, the supply to the circuit must be dead. Turn the power off yourself and use a tester screwdriver to be extra sure. To be forewarned is to be forearmed. One can’t be too careful when it comes to working with electricity. In this circuit, the power comes in through the first switch. The hot is connected to the common on the switch and the neutral is spliced to all the switch boxes through the neutral terminal of the light. The switches connecting the travelers are connected with a three wire cable. A 2-wire cable is used for the purpose of connecting the last switch to the light fixture. The common on the last switch is connected to the hot terminal of the light fixture. 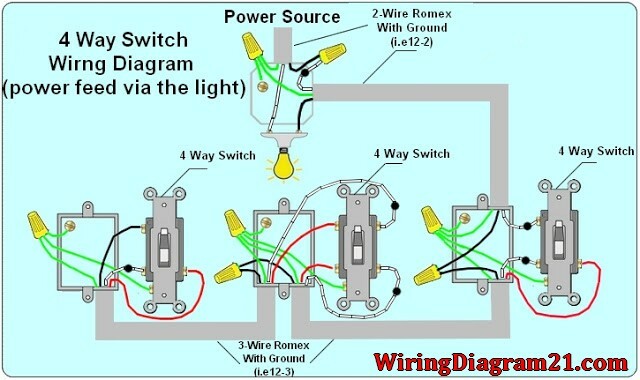 In this method the power source is at the light fixture and the two 3-way switches follow after the light fixture. A 2-wire cable is connected from the light fixture to the first 3-way switch. 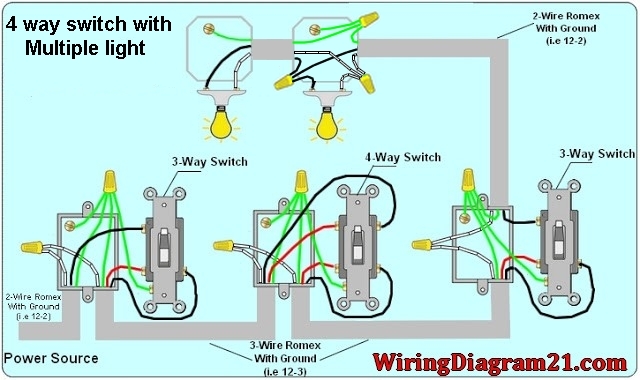 The hot source is connected to the common on the first switch and the hot terminal on the light is spliced through all the light fixtures to the common of the last switch. Here the traveler run from the first switch to a set of terminals on the 4-way switch and from the second switch to the travelers on the last 3-way switch. 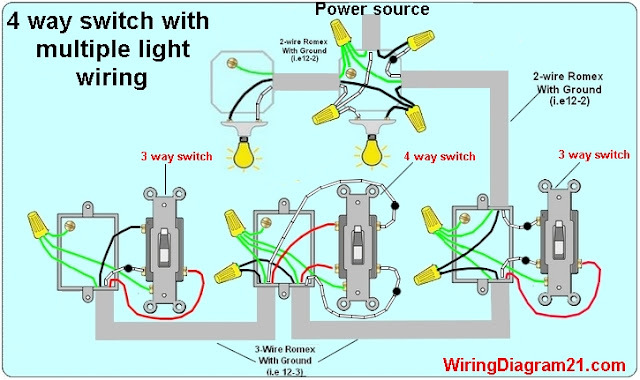 The source of the hot to the light is the common terminal which is spliced through each switch box. What do you use to make your diagrams. I'd like to diagram a few circuits at home. As all of us know, a cable tester is a device used for testing the energy and connectivity of a cable. Diagram labeled "power feed via the light" is incorrect. The two outside switches are NOT 4 way switches, they should be labeled 3 way switches.